Deutsche Bank analysts stated in a recent report that they believe the global economy is at an “inflection point” that heralds the end of a 35-year bull market in bonds. Bonds are anything but primed for growth. In this current environment, there just isn’t a whole lot of room for bonds to run. We’re currently in a world of historically low-interest rates, with the first negative interest rates in history occurring in other developed nations. Bonds may experience another period like the 50’s to the 70’s, where bonds struggled to return even the rate of inflation. Project Titan has long been rumored to be Apple’s top-secret autonomous car initiative. Many expect Apple to eventually release its own car that it either manufactures itself or partners with an automotive manufacturer to build. However, Apple has recently laid off employees who were tasked on the project. It seems that there’s been a lot of internal struggles with the project (with Apple taking a hard look as to whether it should even try to build a car) and Apple may have decided to pivot toward building just software for such cars rather than hardware and software. 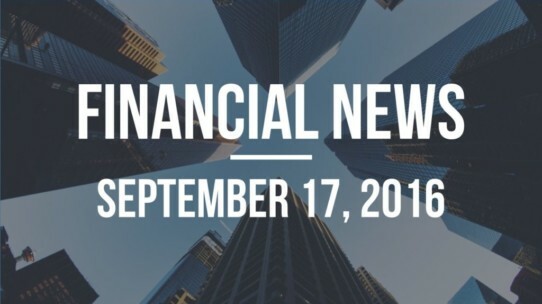 There has been a lot of market turmoil over the last week about what the policymakers at the Federal Reserve will decide to do with interest rates during the September 20-21 meeting. Many expect them to maintain interest rates at their current level, with only 15% of traders expecting interest rates to rise. However, the continued indecision of the Fed has led to increased volatility in the markets. ”Despite printing over a trillion euros ($1.12 trillion) and adopting a range of measures to stimulate lending, the European Central Bank has missed its target of almost 2 percent inflation for over three years. “Borio argued that, at a time when inflation is kept low by globalization and technological advances, continued stimulus risks creating a situation in which debt is difficult or impossible to repay, or “debt trap”. The US Department of Justice is pursuing $14 billion in fines against Deutsche Bank for its part in the financial crisis and mispresenting the mortgage-backed securities it was selling. However, it’s unlikely that the bank will pay that high of a fine. The DoJ demanded Citigroup pay $12 billion and it eventually paid $7 billion, and Goldman Sachs paid $5 billion on similar claims. Deepmind, Google’s star artificial intelligence subsidiary, has been making a lot of news this year. Earlier this year it beat the world champions of Go, a game infinitely more complex than chess, with its AlphaGo program, now it’s making near-lifelike voice simulations with a better version of voice software. Siri, Cortana, and Google Now all sound loads better than robotic voices in the past, but they still sound robotic. Well, WaveNet, Deepmind’s new initiative has created a voice that is near-lifelike and pushing the uncanny valley between robotic voice and human voice. Give it a listen on their blog, in a few years we’ll be using this type of technology to read us books and listen to anything else we want our personal AI overlords assistants to read to us. Amazon’s Jeff Bezos is building rockets at Blue Origin to take on the likes of Elon Musk’s SpaceX and the growing number of commercial space companies. After having successfully launched a small rocket to sub-orbital altitudes and landed its booster back several times thus far, he’s going big on his next venture. His new design, a heavy-launch vehicle named New Glenn, will be almost as tall as the Saturn V rocket that launched astronauts to the Moon, and about half as powerful. The nice thing about the plans of the 4th richest man is that he’s entirely self-funded the company. So there’s no deadlines and has the drive (not to mention the resources) to see it through to completion. Business Insider has a cool recap of riding in an Uber autonomous vehicle through Pittsburgh. It’s mostly photos so it’s a quick read. Sign up for our newsletter and receive a free copy of the exclusive 4-part video course "How to Protect (And Even Grow) Your Portfolio In Any Market"